And Cromwell sent Colonel Pride to purge the House of Commons, of the Presbyterian Royalists leaving behind only the rump Parliament,which appointed a High Court at Westminster Hall to indict Charles the First for tyranny, ooh! Charles was sentenced to death even though he refused to accept that the court had jurisdiction. Say goodbye to his head! The Settling is a pure historical without any science fiction or fantasy trappings. It’s also incredibly boring, lacking for any source of major tension and full of poor characterization, all topped off by a poor attempt to “humanize” one of history’s most polarizing figures. It all adds up to The Settling simply being a poor story overall. English Restoration in 1660, Cromwell’s corpse was dug up, hung in chains, and beheaded. Needless to say, Cromwell’s reputation is…mixed. To keep it simple, one man’s freedom fighter (John Milton) is another man’s terrorist (Winston Churchill). Where he was considered among the top ten Britons of all time by a 2002 BBC poll, mentioning his name in Scotland or Ireland isn’t strongly advised. In the hands of a novice writer, choosing such a controversial figure at such a pivotal time in history could have spelled instant disaster. With Simon Guerrier behind the pen, however, the story initially had a chance. Guerrier has penned numerous stories for Big Finish, primarily in the Short Trips and Graceless ranges, along with several Companion Chronicles and even a few adventures for the Tenth and Eleventh Doctors for IDW Comics. For such a veteran writer, The Settling turns out…functional, from the point of view of a husband to an English teacher. The plot unwinds as it should, and makes sense, but that’s the highest point the story hits. The overall narrative device for the story is Ace and Hex in the TARDIS, having tea and discussing the events of the story, intercut with the story itself. While the Doctor and companions turn out OK 99% of the time, using this device undercuts any source of tension regarding the characters, such as when Hex is threatened with being burned at the stake during the first episode cliffhanger and threatened with hanging during the third act cliffhanger. Deep down, the listener knows Hex will be fine, but the “discussing what happened as it happens” method robs the the story of any tension or nail-biting. The characterization of a few of the players is way off as well. One of them, thankfully, is NOT Sylvester McCoy. Caught up in events, the Doctor does his best to fulfill two conditions: keep his companions in one piece, and do his best to keep his little corner of the adventure tidy and safe. While Ace and Hex shoot the first concept in the foot very early on, the Doctor spends much of the story focusing on the one thing he can control; keeping Mary, a pregnant woman from Drogheda, safe. While the big picture beings to swirl around him in the latter part of the story, early on the Doctor tells everyone to not fight if they can help it (Cromwell’s forces did respect civilians) and persuades Mary to put the gun down and not shoot looting soldiers. Of course, later on he does march Mary through the pouring rain towards Wexford in an attempt to find the live twin brother of her now dead husband…but it does lead to a pretty great second act cliffhanger where the Doctor realizes that he’s going to have to be a midwife as Mary’s waters are gone! Sadly, this does lead to the Doctor being “out of the action” for most of the story, sidelined from the narrative into the b-plot. But, we do get to see a bit of the quiet anger of the Doctor later on, as he assists with helping Cromwell’s wounded soldiers even though he knows they’re going to get back up and go on fighting and pillaging. It’s a nice “do no harm” moment that shows the Doctor’s contradictions and McCoy handles it very well. When the Doctor finally confronts Cromwell, for once there isn’t this explosion of rage from the Doctor. Instead, he simply tells Cromwell that he thinks what the Lord Protector had done is wrong and he needs to consider his actions in the future…and then turns back to the surgeon for a discussion about possibly founding the Royal Society of Medicine. McCoy is the best part of The Settling and it’s a damn shame the rest of the story doesn’t match up to his performance. The biggest missteps in terms of character come from Ace and Hex. I don’t know if this was supposed to be Hex’s “coming out” story (kind of like how The Council of Nicaea was supposed to be Erimem’s) in terms of stepping into his own as a companion, but if that’s the case I’m not that enthused. Granted, Philip Oliver does a very good job with Hex in this story in some ways, as someone who’s confronted with one of England greatest heroes/greatest monsters, who he tries to see more of as a man than some mythical figure. It sort of works, but it boils down to Hex yelling at Cromwell that things shouldn’t be done in a bloody and brutal way, and Cromwell agrees until the situation calls for that EXACT method, rendering Hex’s involvement useless. 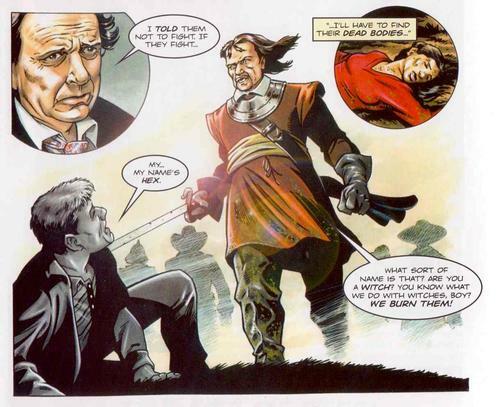 Early in the story, Hex, true to his medical training, is very reluctant to fight and impresses Cromwell in standing up to a soldier, but later on has picked up a sword and is holding his own against Cromwell’s soldiers, possibly killing a few of them in a HUGELY out-of-character moment recalled in the TARDIS by Hex that’s given the barest lip service. Likewise, Sophie Aldred’s Ace is way too happy to go charging into battle. This is an older Ace/Dorothy, someone who’s see war up close (Battlefield) and personal (Colditz). So why is she gleeful to see history happen by running into the very middle of Drogheda when she and Hex know what’s going to happen? Yes, Ace is brash and brave, but this moment early on in the story is just SO out of character for her. And the Doctor finding her “dead” is never explained – all but gone one moment, fine and coughing the next. My other major complaint with this story is the lack of consequences, and that comes down to Cromwell himself. Guerrier’s script paints Cromwell more towards the “monster” side of the ledger, but he does give Cromwell a few “human” moments. It’s not enough to make up for the fact that Cromwell IS a monster and does absolutely horrible things (his “I do atrocities now to prevent great atrocities later” reasoning” is smacked down by the Doctor during the fourth episode), but the performance by Clive Mantle stays firmly grounded, without any chewing of scenery or moments of large ham. Mantle is another veteran BBC actor, known for a ten year stint on Casualty and more recently as Greatjon Umber on HBO’s Game of Thrones. Mantle covers the gamut of emotions; anger, rage, piousness (his repeated admonishing of Hex’s “oh my God’s”), and determination, mixed in moments of regret and hopes for peace. Guerrier and Mantle don’t set out to rewrite Cromwell’s past, but lay it out in an even manner, based upon historical evidence; the massacre in Drogheda and sack of Wexford DO happen, but if there was someone there who tried to mitigate Cromwell’s excesses, how would it go? I could imagine it going much like Hex and Cromwell’s exchanges in this story, which is high praise. The supporting cast…eh. Hugh Lee is the plot device to move the characters from Drogheda to Wexford, twin brothers Keiran (Mary’s husband and soldier at Drogheda) Fitzgerald and James (twin brother to Keiran and officer at Wexford) Fitzgerald. Roger Parrott, aka Neville Chamberlain in The King’s Speech, has a decent part as Doctor Goddard, a surgeon in Cromwell’s army who serves to give the counterarguments to Hex or Cromwell. Claire Cathcart’s Mary is another plot device who’s sole purposes are to give the Doctor something to do away from Ace and Hex AND provide the catalyst for the fighting in Wexford to stop when, after being shot through the lung, she miraculously survives. She also serves to add a bit of humor with her pregnancy and labor in the third episode. But Mary mentions that her and Keiran got married quickly because she found out she was pregnant, and that the people of Drogheda think her baby is cursed and the reason Cromwell is attacking them. And nothing more comes of this plot. Hex debates leaving the TARDIS and asking Ace to come with him.. And nothing more comes of this plot (though it’s done better than Erimem’s waffling in Three’s a Crowd). Hex and Ace see war up close, with Hex killing a few soldiers. And nothing more comes of this plot. Hell, nothing seems to come from Hex, Ace, and the Doctor meeting Cromwell. That’s what really makes The Settling fall flat. There’s just no sense of ANYTHING that happened having any meaning at all. Granted, not every audio is going to shake the foundations of the universe, but there’s no sense of urgency, no sense of peril, no sense of a lesson learned. And there IS the potential for one, when Hex and Ace discuss how the Doctor repeatedly tells them “history can’t be changed,” and they conclude that perhaps the Doctor means the big things can’t be changed, not the little moments. It’s a quiet scene and one that I really wish had been expounded on. Coming off of The Kingmaker and the Fifth Doctor being accused of keeping history secure regardless of the cost to the common man, having the Seventh Doctor involved in “a tweak here and there” would have been an interesting little discussion. But, in the end, it seems like the events of The Settling are just a nusience to the Doctor. As Hex and Ace are having their moments of the soul inside the TARDIS, he’s spending a few hours outside talking to people. And that’s pretty much the entirety of this serial. A whole bunch of noise and words, but in the end nothing really happening or getting accomplished. Although, there is ONE thing that got settled…Hex hits on Ace, Ace says she sees him more as a “little brother,” and it’s left at that. This was a weird review to write, and here’s why. I do look at other reviews online for the stories I’m reviewing, partially to make sure I’m not accidentally plagurizing someone’s work but also just to see where my reviews fall with others. I’m usually not too far off, in that I’ll like something that the general consensus disliked, or only like something that other people loved. When I checked out this story’s reviews, however, they were universally high. A lot of praise was given to it for being a solid historical with Hex being amazing and kudos to Mantle’s performance as Cromwell, with few missteps. I actually went back and listened to The Settling a second time just to make sure I wasn’t missing anything. I stand by my initial thoughts. The Settling is boring, has no real tension, and aside from Oliver Cromwell’s portrayal and the Doctor having a few moments, there’s just no real meat to this story. Synopsis – Aside from Clive Mantle’s performance as Oliver Cromwell, there’s just nothing to recommend about The Settling, a boring tale with poor characterization for the companions and a Doctor that treats the main storyline as little more than an annoyance. 2/5. This entry was posted in Big Finish Review and tagged 2/5, Ace, Big Finish, Big Finish Audio, Big Finish Review, Doctor Who, Doctor Who Audio, Doctor Who Review, Hex, Philip Olivier, Seventh Doctor, Sophie Aldred, Sylvester McCoy, TARDIS. Bookmark the permalink.